This particular kit from Master Box continues their US Civil War offerings with a cavalry charge set. 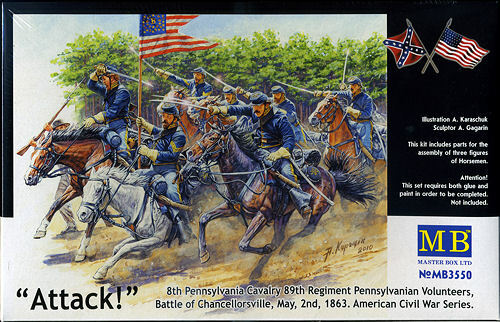 It is meant to depict the charge of the 8th Pennsylvania Cavalry, 89th Regiment at the Battle of Chancellorsville in May of 1963. The set includes three figures, all on horseback. The one holding the flag is shown as stumbling while the other two have sabers drawn; one is a slashing pose and the other forward in attack. 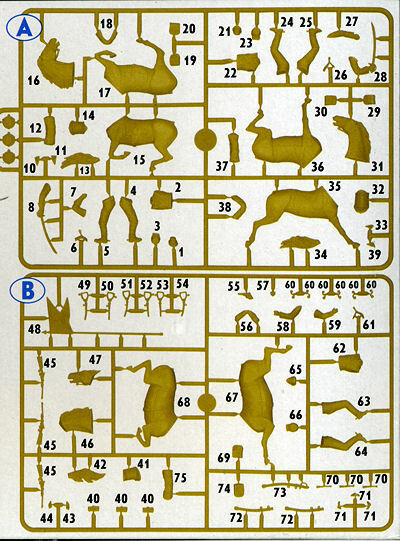 The kit includes two full sprues that have the horses, figures and all of their various bits and pieces as was typically carried by horse soldiers. 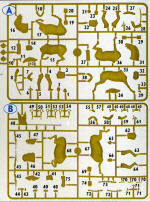 The back of the box provides a painting guide in Vallejo and Lifecolor paints with the various parts placement indicated. This is the second kit in this series and I am sure that a Confederate set will soon be in the offering for fans of this conflict.